Don’t you just love that feeling of trying something new? Spritzing a brand new perfume or swiping on a brand new eyeshadow, adding new items to your beauty regime makes you feel like new! Boots have 1000s of offers across haircare, cosmetics and skincare helping us all feel like new for less. As a complete beauty addict, I love trying a new mascara for the first time (hence getting three in my last Boots shopping haul!) I also love admiring a brand new eyeshadow palette and swiping the colours for the first time. Some would say that three mascaras may seem a bit excessive but I love the feeling of trying a new mascara! I have raved about the Seventeen Falsifeye HD Mascara before, just recently in my product empties video infact. It is an amazing lengthening and volumising mascara. It lasts all day without flaking off or getting clumpy, see it in action in my tutorial here I would recommend this mascara to everyone! Another Boots special I have been loving since it launched just before Christmas is the No7 Midnight Lash, I love it when drugstore mascaras give true results! I’ll admit the pretty packaging of this mascara caught my eye at first but I also love the actual product, the brush in particular applies very well. This is quicker to apply then the Falsifeye because it has a bigger brush with lots of bristles which give you VOLUME. As this is a brand new launch for Maybelline, I just had to try the new Lash Sensational Masacara. As silly as it sounds I generally don’t pick up Maybelline mascaras as I find the packaging a little bulky, it is pretty but I prefer slim mascaras. All that is in the past now because this mascara truly is sensational! There are tiny bristles in between the bigger bristles which means that even the smallest lashes get a good coating, giving a multiplying effect to your lashes. It doesn’t look clumpy at all but did flake just a small amount. I will definitely use this in a tutorial soon so keep an eye out. Being a girly girl I love glitter and sparkle, especially on the eyes! 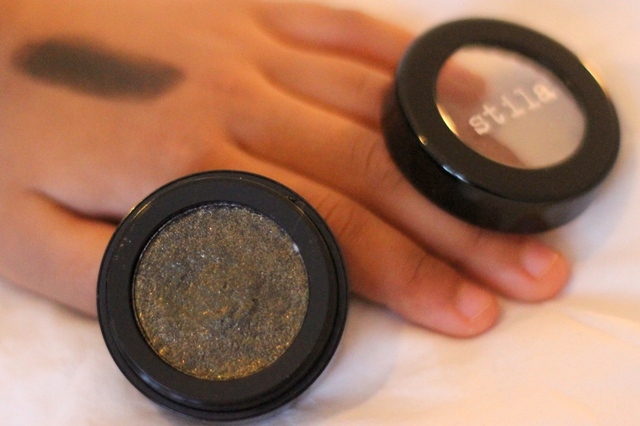 This Stila cream eyeshadow has been on my wishlist for a while, it is packed with glitter but with no fall out as it is cream based. The colour is a black/gold which looks gorgeous for a party look, either all over the eye for a full on glittery smokey eye or just in the outer corners. I may need to go back and purchase a couple more shades! For me, there is nothing quite like opening your own brand new eyeshadow palette for the first time! 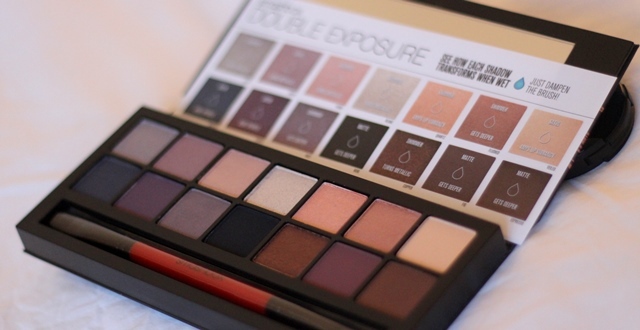 This has to be my favourite purchase by far, I do have a lot of neutral palettes so went for the Double Exposure which has more a bit colour with purples, cranberry shades and pink undertones. There are 14 shades here but once wet they all change to either glitter, metallic, shimmer or deeper so there’s actually 28 shades to play around with here. I am really excited to create different looks and tutorials with this palette, only thing is…I now want the Full Exposure palette too!